Have you ever walked by the clearance aisle or been at a yard sale and bought something because it was only $1 or so? That's what this frame was for me...clearance at Hobby Lobby impulse buy. From a distance I kind of liked it (this was about 7 or 8 years ago). It was big, I love red, and the scrolly lettering looked kind of cool so I grabbed it and didn't even think to read it until I got home. That's when I fell out of love with it. We used it for a while but eventually it was shoved in a closet where all of the other items I have bought go until I get around to fixing them. We're talking years! Those pictures are from the night we got engaged. We look so little! 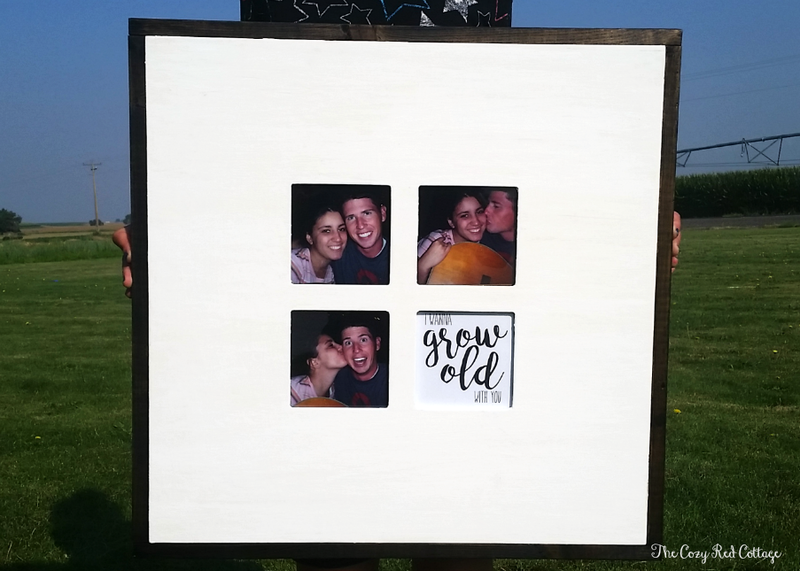 You probably don't have the same frame I have but this will work with any frame (canvas, sign, etc.) with a straight edge. 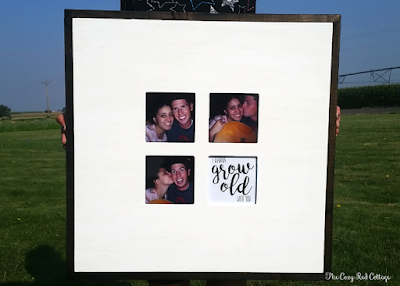 Check your stash of frames or turn some of those unfinished frames you find at the craft store into a showstopper! Optional step: If you have any type of design or lettering on your frame gently sand it down to avoid seeing it through your new, beautiful paint job. 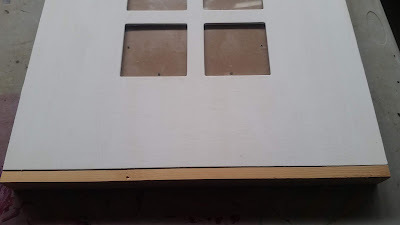 Or if its not wood but plastic (I think its plastic..I don't know what it is) gently sand where you are going to paint. It will give your paint something to grip. 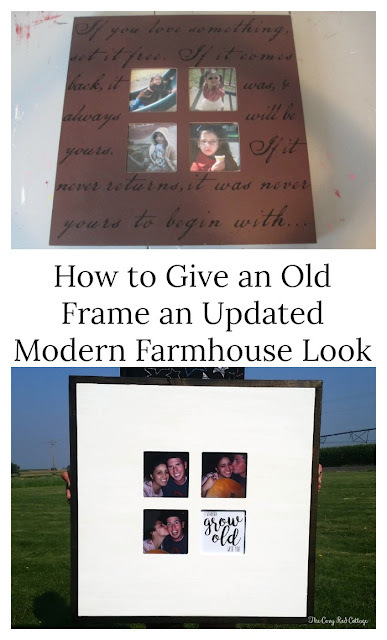 My frame is not wood so I can tell you paint will work. Next Paint! 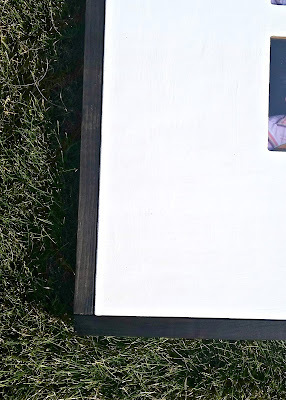 I recommend chalk paint. It works on pretty much any surface. I tried acrylic at first and eventually gave up. I used this brand in white Adirondack. It works great, its inexpensive, and last bottle of paint seems to last forever! Also I use these brushes. It makes a huge difference in quality and I think speed then using a regular or foam brush. It took about 3 coats. Now its time to build your frame. 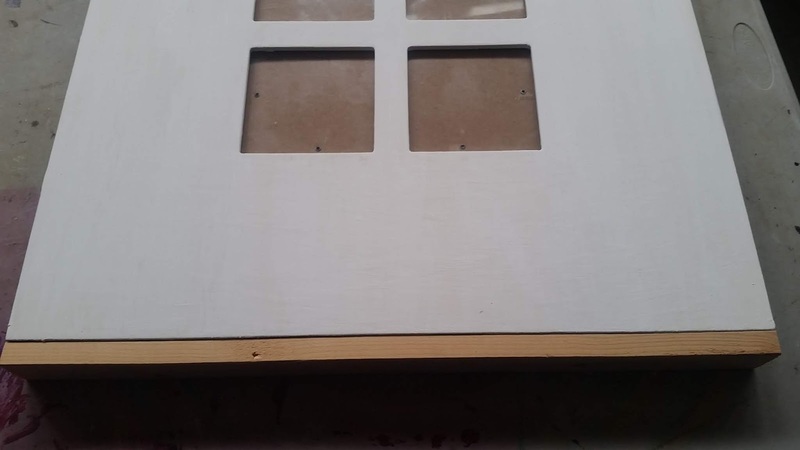 I use cheap 1x2 furring strips for my frames. They are around $1 each. 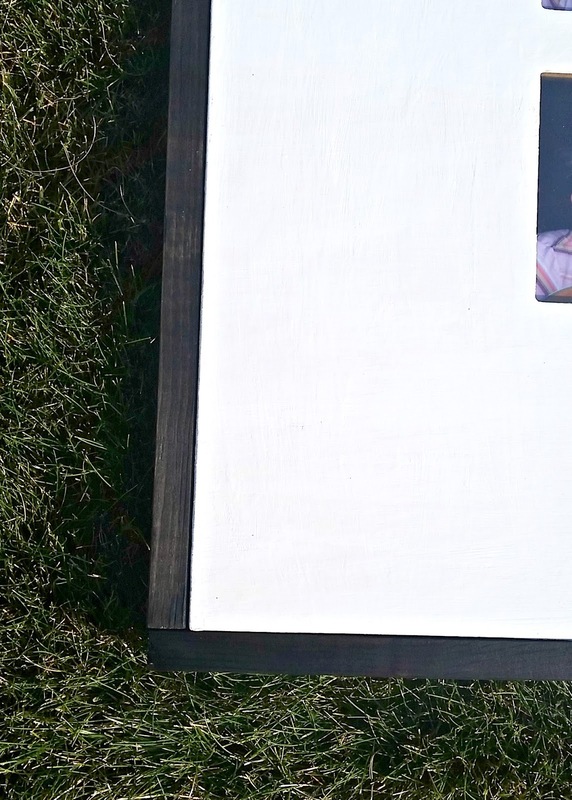 Measure the bottom of your frame and the top of your frame and cut your boards to match. Move into place for the next measurement. 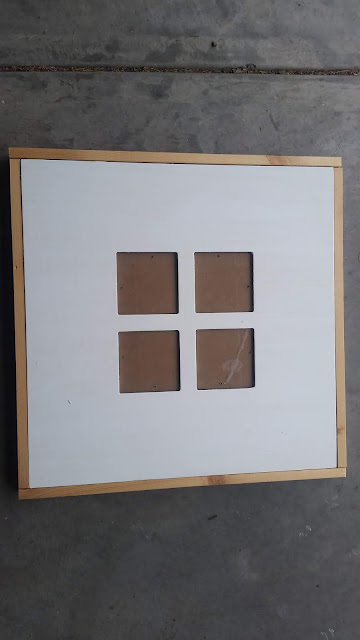 For the sides you are going to measure from the top corner of your "frame" at the top to the bottom of your "frame" at the bottom. Cut your wood. Here's a close up of the corners. Here's a better visual from another project I made. There are some more detailed instructions in that post as well. (find it here). Here's what your frame should look like. 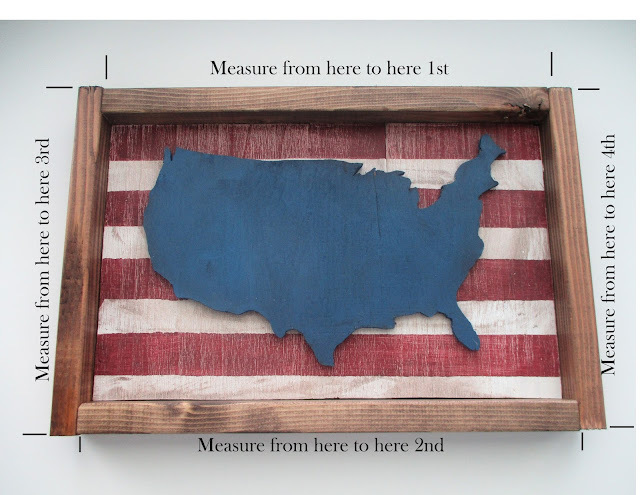 Now that its all cut to size paint or stain your wood. (I love this stain). For this project I used ebony. Once your stain is dry its time to attach your frame. 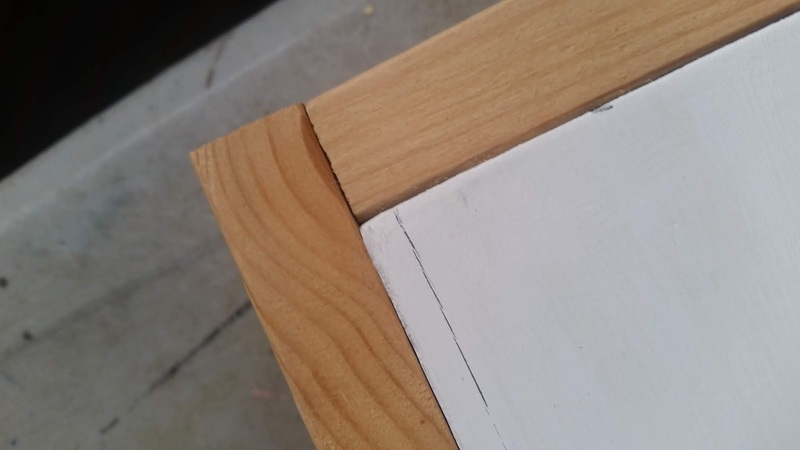 Move your wood into place and glue together with wood glue (this stuff works great). That's all I used but you can add a few nails with a nail gun. I'm not putting any weight on the actual wood frame so just the glue has worked for me.